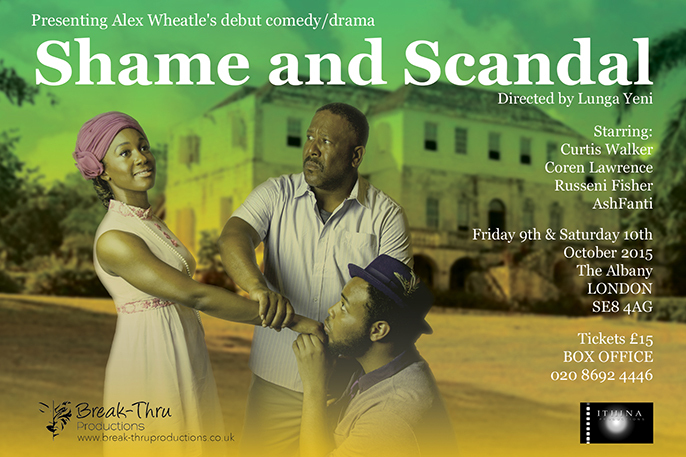 A new production of acclaimed novelist Alex Wheatle’s debut play SHAME AND SCANDAL arrives on stage at London’s Albany Theatre for two nights only Friday 9th October and Saturday 10th October. A co-production between London based Break-Thru and Ithina Productions, this dark comedy is directed by Lunga Yeni and stars Curtis Walker. SHAME AND SCANDAL is the tale of an affluent Jamaican family consumed with keeping their financial legacy intact. Brimming with twists and turns this dark comedy set in 1960s Jamaica; sees the prodigal son Michael’s return home with his power hungry fiancé Sophia. Milton and Diana put the young couple through their paces. As life-altering secrets are revealed tensions mount and they all battle to keep what they feel they rightfully deserve. The cast includes Curtis Walker whose many credits include YOUNGERS E4 as Milton Lawson; Coren Lawrence whose credits include STRICTLY BINGO as Sophia Banton; Russeni Fisher whose credits include HANSEL & GRETEL at Theatre Royal Stratford East as Michael Lawson and Ash Fanti as Diana Lawson. Artistic Director Lunga Yeni directed a sell-out production of PUMPKIN SOUP FOR THE SOUL (read review) at Chats Palace. Other credits include; BECOME A MAN and THE THING ABOUT SHIRLEY (Hackney Empire) and INCOMPATIBLY YOURS (Lyric Hammersmith).